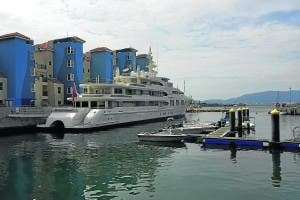 MYSTERY surrounds the owner of a multimillion pound super yacht which has been docked in Gibraltar for a week. Ecstasea was built for Russian billionaire and Chelsea FC owner Roman Abramovich in 2004, but was sold five years later. It has since been linked to everyone from American philanthropist Sonja Zuckerman to the crown prince of Abu Dhabi and Pakistani billionaire Alshair Fiyaz. What is known is that the 86-metre luxury yacht boasts eight ‘staterooms’ for 12 guests, a helicopter pad, room for 25 crew members, a gym and a Jacuzzi. It is registered in the Cayman Islands. “It was here for a week or so and is now enroute to the Caribbean for the winter, as I understand it,” a source told the Olive Press. He added that Abramovich’s current superyachts had also been on the Rock this summer. 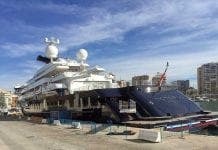 He added that software tycoon Paul Allen’s boat Octopus was also in Gibraltar last month. “It was here just after a submarine from the ship located the bell from HMS Hood off Denmark. The superyachts generally cost around £40 to 50 million a year to run and around £300,000 to fill up. Gibraltar is a popular place to fill up, thanks to its cheap fuel costs, and it is a busy docking off point. Next articleGushing smile, flash of cleavage – action! I saw it with my own eyes Fred, the physical impossibility that is a boat docking in a harbour. Chief Reporters get all the best stories lol.